Medical Powerpoint Slides: what is Autism? Autism is a disorder of neural development in which a child suffering from autism not able to communicate and talk with other. People suffering from Autism live in their own different world. They are very intellegent and sharp minded. Normal sounds and loud music is unbearable by an autistic person he / she cover his/her ears when it happens.Autism causes to act in a different way which is not normal and normal people can't understands them. Autism is seen in the child before 3 years of age. Developments and research is on process to extract more and more things and treatment about this problem. 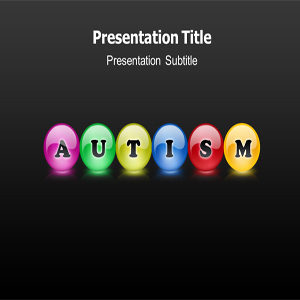 Get latest and new powerpoint templates on Autism, Baby powerpoint template etc. what is conjuctivitis and its symptoms? Coffee - "The secret of long life"